As featured in the Mail on Sunday (February 2018), read the full article online here. You'll be £8.00 closer to your next £10.00 credit when you purchase Balloonomania Belles. What's this? Balloonomania Belles reveals the astonishing stories of the fabulous female pioneers of balloon flight. More than a century before the first aeroplane women were heading for the heavens in crazy, inspired contraptions that could bring death or glory and all too often, both. Award-winning journalist Sharon Wright reveals their hair-raising adventures in a book that brings the stories of the feisty female ballooning heroines together for the first time. Women were in the vanguard of the “Balloonomania” craze that took hold in the eighteenth and nineteenth centuries and swept across Europe then the world. Their exploits were a vital element of our first voyages into the sky. When women’s options were often severely limited by law and convention they managed to join the exhilarating quest for spectacle, adventure and danger among the clouds. Many of the brightest stars of this extraordinary era of human flight were women. From the perilous ascent in 1784 by feisty French teenager Elisabeth Thible, female aeronauts have never looked back… or down. Who were these brave women who took to the air when it was such an incredibly dangerous and scandalous thing to do? Sharon Wright brings together in one book the show-stopping stories of the very first flying women. The real life stories of women balloonists will entertain readers as they embark on a journey through the unpredictable and incredible. This book is fun and lively—an uplifting treatment of an uplifting subject. Entertaining chronological history of the women who got in to hot air balloons almost as soon as the were invented in the late eighteenth century and who were chucking themselves out of them in the early twentieth century, for fun and money. This is the story of aristos and actresses, taken by the thought of flight and taking their places with there male contemporaries in the skies. It’s an obscure bit of history, but still fascinating. Easy to read and sufficiently detailed, this book is the place to start if you’re interested in the history of aeronautical women. I found the incidental commentary on the changing technology involved in ballooning, the use of various gases and the development of parachutes, as well as attitudes towards women ballooners, interesting. Rather than being a strict ‘this woman was the first to do this, this woman did this’, the book covered all sorts of little details that add colour to the time period. 'I shared a hilarious afternoon with Sharon Wright, as she related tales of aeronautical lady-balloonists. You couldn’t want for a better antidote to pinkness than these tales of girls and women unleashing their pluck and inventiveness in the unregulated age of balloonomania...This is history at its most satisfying. You can’t keep a good woman down! This was certainly true of the early balloonists. The world’s first manned flight took place in Paris on 21 November 1783; the first women to fly (four of them) took off from the same city six months later. This was a private ‘experiment’. The first public ascent by a female took place in Lyon the following month. Ballooning was very much an equal opportunities activity. The only qualifications were raw courage and maybe half an hour’s parachute training. Since ballooning remained largely a public entertainment until the early 20th century, the first female balloonists were mostly actresses, but later on waitresses and runaway teenagers all took to the skies. It was horribly dangerous, and many died young. 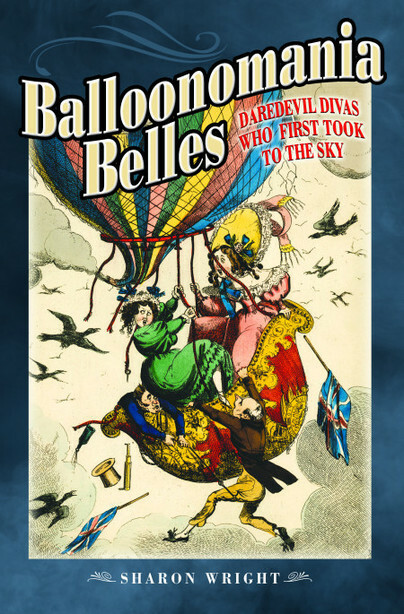 Balloonomania Belles tells the story of the leading female balloonists in France, Britain and America from the 1780s to the 1910s. Eventually aeroplanes displaced balloons, leaving a new generation of women to pioneer a new form of flight. Featured article: "Up, Up and away." A refreshingly good read for a book on ballooning charting the adventures and misadventures of women since the 1780s who were besotted with ballooning. Sharon has researched this book deeply. I read a lot of ballooning books but this one I enjoyed more than most. I really do recommend it. It is a lively and spirited read that may particularly appeal to those who are looking for an unusual twist or a different perspective for the next book on their reading list. 'Sharon Wright tells a fabulous tale, and has uncovered some terrific stories of long forgotten heroines of the air. Some stories are comic, many are tragic, many are a bit of both, and she tells it brilliantly'. As featured in Library additions. A lively, well-written example of 'feelgood non-fiction', this story of life in a remarkable age is highly recommended. There always seems to be a surprise book, one that doesn’t appeal for some reason, but which turns out to be a really good read. Balloonomania Belles was that surprise book. Warmly recommended. The author presents a fascinating account of how women eagerly took to the freedom of the skies to further their cause and express their freedom. I love the incredible exploits of these wonderfully daring female aviators. They were flamboyant, unconventional and courageous at a time when women had little opportunity to exploit their talents on the ground. As a fellow hot-air balloon pilot I understand their joy of merging with the wind and the sky, but without the risks these early pioneers dared to take. Sharon Wright is an award-winning journalist and playwright. She was born in Bradford, West Yorkshire, and now lives in South West London with her family. She has worked as a writer, editor and columnist for leading national magazines, newspapers and websites. These include The Guardian, Daily Express, BBC, Disney, Glamour, Red and Take a Break. She is also the author of critically acclaimed plays performed in Yorkshire and London, including Friller about balloonist Lily Cove.